In recent years, Canadian Stick player Jim Reilly has become the man of a thousand roles in the Stick community. In addition to his role as musician and Stick player, Jim is an experienced music educator having spent many years teaching guitar, bass, and Stick in his home town of Kamloops, British Columbia. In 2000, he taught at his first Stick seminar along side Greg Howard in Charlottesville, Virginia. Since then, he has taught Stick seminars in Kamloops, Vancouver, Yamhill, Ann Arbor, and again in Vancouver (Salt Spring Island) in April of this year. He is also scheduled to teach at the Montreal seminar happening in June of this year. In addition to music, Jim also plays the role of journalist. He worked for CFBX radio in Kamloops hosting a weekly show playing all Stick artists. He also did a feature on the Stick for CBC Radio One and has an ongoing series of interviews called "Talking Sticks" that have been presented on CFBX and are written up here at stick.com. Jim's lastest journalistic efforts include two Stick features published in this month's issue of "Bass Guitar Magazine," published in the UK and available worldwide and another feature on Canadian Stick players in the upcoming edition of Muzik Etc. 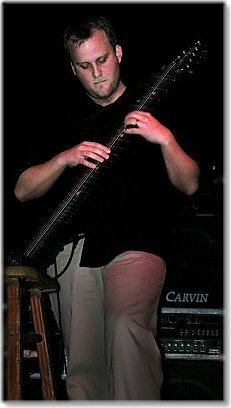 He is also working on several Emmett Chapman biographical projects slated to hit the streets in 2004 to coincide with the 30th anniversary of the first publically available Stick instrument. Jim has also recently finished two CDs "Play" and "Foreplay" just released this month. You can contact him at play_stick@canada.com. He'd love to hear your StickStory. You could even order a CD.